Warwick Goble - Constantinople 1906, Golden Horn, Early Morning - Online gallery supplying original fine art. Trending Modern British and Contemporary Welsh. Available for sale from Big Sky Fine Art; this original painting by Warwick Goble dates from 1906.<br> The watercolour is presented and supplied in a fancy but complimentary frame, mounted using conservation materials and behind non reflective glass. <br> The watercolour features as an illustration in the book “Constantinople” by Alexander von Millingen, illustrated throughout by Goble, published by A & C Black Ltd in 1906.<br> The watercolour is signed lower right.<br> <br> Warwick Goble was an accomplished artist and one of the more prominent illustrators of the ‘Golden Age of Illustration” that spanned the first quarter of the 20th century. He illustrated several classic children's books and particularly specialised in oriental themes, in which his work is exquisite.<br> <br> Goble was born in Dalston, north London, on 22 November 1862. His father was a commercial traveler. He was and educated and trained at the City of London School and the Westminster School of Art. <br> <br> He worked for a printer specializing in chromolithography and contributed to the foremost illustrated papers of the day, including The Pall Mall Gazette, The Westminster Gazette and Windsor Magazine.<br> <br> In the 1890s, he contributed half-tone illustrations to monthly magazines such as The Strand Magazine, Pearson's Magazine, and The Boy's Own Paper. In 1893, he was exhibiting his art at the Royal Academy. In 1896, he began illustrating books, finding that his delicate watercolours were the perfect vehicle for the new illustrated books of the early 20th century. New printing methods allowed watercolour works to be published with immense details and true colouration. In 1898, he was the first to illustrate H. G. Wells's The War of the Worlds, having illustrated it for Pearson's Magazine in 1897. He briefly continued with scientific romance themes.<br> <br> By 1909 publishers were immersed in a public demand for colour-plate books. Goble had found his true talent and became resident gift book illustrator for MacMillan and produced illustrations for The Water Babies, Green Willow, and Other Japanese Fairy Tales, The Complete Poetical Works of Geoffrey Chaucer, Stories from the Pentamerone, Folk Tales of Bengal, The Fairy Book, and The Book of Fairy Poetry, amongst others. Goble was thus responsible for some of the most lavishly illustrated books of the day. He was highly influenced by certain Chinese and Japanese artistic techniques that he mastered, and became the preferred artist for Asian story books. His colour sense and his watercolour techniques were always of the highest caliber and he created some truly memorable images.<br> <br> During World War I, he was employed in the drawing office of Woolwich<br> Arsenal, and volunteered for service with the Red Cross in France. He made a tour of the French battlefields in 1919.<br> <br> After the war he resumed his career. He worked occasionally for New York MacMillan, and produced editions of Robert Louis Stevenson’s Treasure Island and Kidnapped. <br> <br> Goble gradually gave up illustration to pursue sculling, cycling, and travelling. 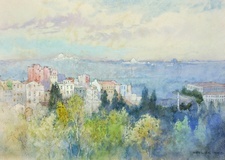 He died in his home in Richmond, Surrey on 22 January 1943.<br> <br> This original watercolour from 1906 depicts a view of the Constantinople, the city now known as Istanbul. Historically, this great city was also known as Byzantium. The city is famous for being where east meets west; it straddles the Bosporus Strait which separates Europe and Asia, between the Sea of Marmara and the Black Sea. Today it is the most populous city in Turkey, the largest city in Europe and the seventh largest city in the world.<br> The work shows Constantinople in a sentimental light, but the vista from apartment to mosques, and the sea beyond hints at the significance of the place; there is a low- lying mist in the distance, with the domes and minarets of several mosques just visible. In the mid--ground we see the tops of apartment buildings, cream and hues of pink, with pink terracotta roofs. In the foreground are tall pale green trees, with a row of darker trees closer to the city. The overall palette is bright and delicate, and the effect is simply stunning. Available for sale from Big Sky Fine Art; this original painting by Warwick Goble dates from 1906. The watercolour is presented and supplied in a fancy but complimentary frame, mounted using conservation materials and behind non reflective glass. The watercolour features as an illustration in the book “Constantinople” by Alexander von Millingen, illustrated throughout by Goble, published by A & C Black Ltd in 1906. Warwick Goble was an accomplished artist and one of the more prominent illustrators of the ‘Golden Age of Illustration” that spanned the first quarter of the 20th century. He illustrated several classic children's books and particularly specialised in oriental themes, in which his work is exquisite. Goble was born in Dalston, north London, on 22 November 1862. His father was a commercial traveler. He was and educated and trained at the City of London School and the Westminster School of Art. He worked for a printer specializing in chromolithography and contributed to the foremost illustrated papers of the day, including The Pall Mall Gazette, The Westminster Gazette and Windsor Magazine. In the 1890s, he contributed half-tone illustrations to monthly magazines such as The Strand Magazine, Pearson's Magazine, and The Boy's Own Paper. In 1893, he was exhibiting his art at the Royal Academy. In 1896, he began illustrating books, finding that his delicate watercolours were the perfect vehicle for the new illustrated books of the early 20th century. New printing methods allowed watercolour works to be published with immense details and true colouration. In 1898, he was the first to illustrate H. G. Wells's The War of the Worlds, having illustrated it for Pearson's Magazine in 1897. He briefly continued with scientific romance themes. By 1909 publishers were immersed in a public demand for colour-plate books. Goble had found his true talent and became resident gift book illustrator for MacMillan and produced illustrations for The Water Babies, Green Willow, and Other Japanese Fairy Tales, The Complete Poetical Works of Geoffrey Chaucer, Stories from the Pentamerone, Folk Tales of Bengal, The Fairy Book, and The Book of Fairy Poetry, amongst others. Goble was thus responsible for some of the most lavishly illustrated books of the day. He was highly influenced by certain Chinese and Japanese artistic techniques that he mastered, and became the preferred artist for Asian story books. His colour sense and his watercolour techniques were always of the highest caliber and he created some truly memorable images. Arsenal, and volunteered for service with the Red Cross in France. He made a tour of the French battlefields in 1919. After the war he resumed his career. He worked occasionally for New York MacMillan, and produced editions of Robert Louis Stevenson’s Treasure Island and Kidnapped. Goble gradually gave up illustration to pursue sculling, cycling, and travelling. He died in his home in Richmond, Surrey on 22 January 1943. This original watercolour from 1906 depicts a view of the Constantinople, the city now known as Istanbul. Historically, this great city was also known as Byzantium. The city is famous for being where east meets west; it straddles the Bosporus Strait which separates Europe and Asia, between the Sea of Marmara and the Black Sea. Today it is the most populous city in Turkey, the largest city in Europe and the seventh largest city in the world. The work shows Constantinople in a sentimental light, but the vista from apartment to mosques, and the sea beyond hints at the significance of the place; there is a low- lying mist in the distance, with the domes and minarets of several mosques just visible. In the mid--ground we see the tops of apartment buildings, cream and hues of pink, with pink terracotta roofs. In the foreground are tall pale green trees, with a row of darker trees closer to the city. The overall palette is bright and delicate, and the effect is simply stunning.